ALRAID | Islamic Centres Ramadan Programme: Ready for the Productive Fasting! Ramadan is a very special time when the believers thrive to make the most for their soul. Islamic Centres “Alraid” traditionally welcome Muslims, as well as non-Muslims curious what the Muslims do on Ramadan, for a special programme. Lectures and Taraweeh prayers at Kyiv ICC Mosque are held daily, and public iftars are held six times a week (Thursday is the Cleaning Day). - Tea Party and spiritual reminders — between iftar and Isha. This year, the women dine at the second floor of the mosque, while the men will be breaking their fast in a special tent in the ICC yard. OOn the days when iftar is served, parents can leave their children after iftar and until the end of taraweeh with a babysitter. On 25 of Ramadan, a Qur’an recitation contest is to be held. During the last ten days, everyone willing can stay at the mosque 24/7 for itikaf. - taraweeh prayers and reminders in the pauses of taraweeh. During the last ten days, everyone willing can stay at the mosque 24/7 for itikaf. Children’s Ramadan camp is also in the plans. - Preachings and lessons before Isha. Public iftars are to be held on every weekend, Saturday and Sunday, with contests on religious knowledge right after them. During the last ten days, everyone willing can stay at the mosque 24/7 for itikaf, listen to spiritual lectures in English, and participate in Qur’an recitation contest and Contest on Fiqh. The participants of the Qur’an recitation contest are to be divided in several groups; Arabic speakers are expected to recite any three successive juzz, while non-Arabic speakers need to recite “al-Mulk”. There will be a written contest on Fiqh. Iftars at Zaporizhzhia Islamic Cultural Centre are to be held every Monday and Thursday, except for the first 3 days and last 10 days of Ramadan when Iftars are to be held daily. - taraweeh prayer and spiritual reminders. Lectures on Qur’an will be held twice a week, and during the last decade of the month each and every willing person can test their knowledge of the Holy Book in a Qur’an Recitation contest. The adults are expected to know the surahs “al-Kahf”, “Ya Sin” and “Ar-Rahman” (not only to know the test, but to understand the meening of each of the surahs and their main lessons); the kids younger than ten are expecter to perform a simpler task (three levels: 5 short surahs, or surahs 101-114, or all the short surahs). THe kids are also encouraged to participate in creative contests. The women’s department is planning to hold additional lessons, Qur’anic readings twice a week, and charity benefits. Zaporizhzhia Muslims hope to collect financial aid their adherents from the occupied territories can spend on iftars, and also visit communities in Melitopol and Mariupol to hold joint Friday preachings, iftars and lectures. A citywide iftar is on the roadmap as well. The local Islamic Cultural Centre will host public iftars six days a week (Sunday is the Cleaning Day). - Daily taraweeh and reminders. During the last ten days, everyone willing can stay at the mosque 24/7 for itikaf. On 25 Ramadan, a Qur’an recitation contest is to be held after Asr. 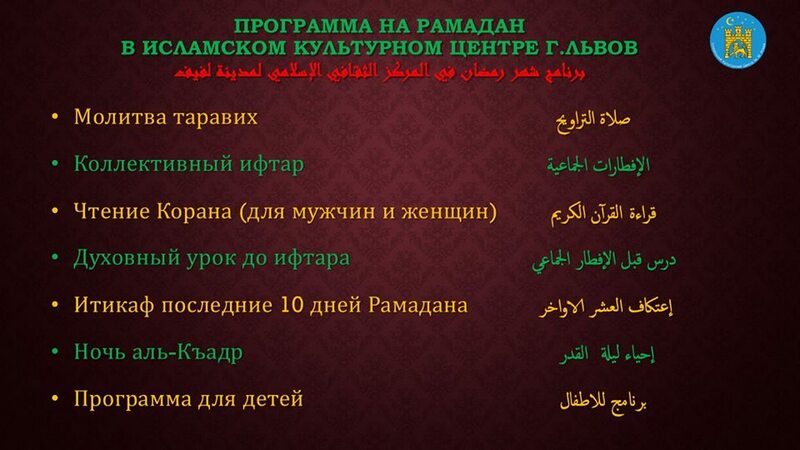 They are planning to read each juz per day after Fajr at Odesa Islamic Cultural Centre. BEsides, there will be lectures after Asr and 20 minutes prior the iftar, and, of course, public iftars. During Ramadan, there will be contests on Qur’an recitation and Fiqh for men, women and children separately, Arabic speakers and non-Arabic speakers apart. Please request the detailed information on participating at Odesa ICC. 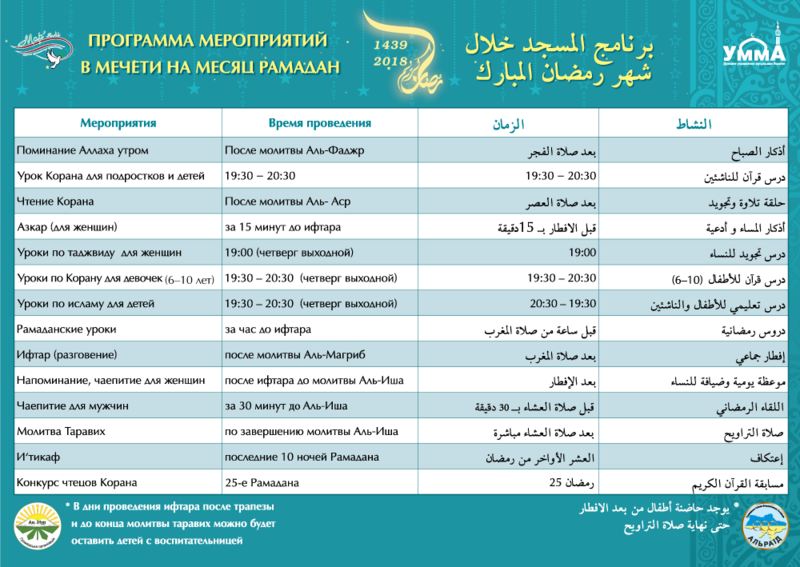 Dnipro Islamic Cultural Centre is to host 5 public iftars in a row in the beginning of Ramadan, and later there will be 4 iftars per week, Thursday to Sunday. The Centre offers educational programme: daily hadith classes (before Dhuhr), Qur’an Classes (at 17:00), and reminders (30 minutes before Maghreb). They are also plannig a Qur’an recitation contest on 25 Ramadan and a special programme on Laylat al-Qadr (27 Ramadan). During the last ten days, everyone willing can stay at the mosque 24/7 for itikaf. 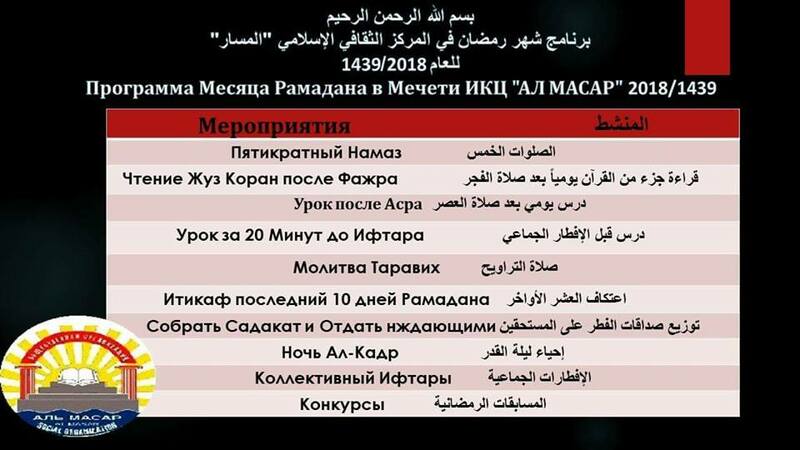 As for the Eid, the Dnipro Muslims are planning the two-stage project: the first stage is to begin at 8:00 at the ICC Mosque, and the second one — at 16:00 at the city park. During the last ten days, everyone willing can stay at the mosque 24/7 for itikaf, and they will be provided with iftar and sukhoor. On the threshold of Laylat al-Qadr, a Qur’an recitation contest for men, women and children is to be held.